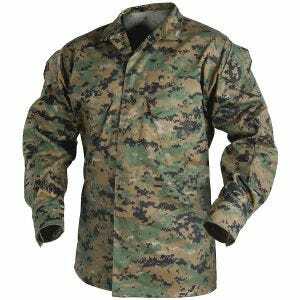 This comfortable, lightweight and practical combat uniform was based on the specification of U.S. Marines Corps Combat Utility Uniform (MCCUU) and is ideal for USMC enthusiasts and duty users. MCCUU shirt features a stand-up collar and full-front button fastening, two bicep pockets with flaps and two angled chest pockets with Hook and Loop flaps, reinforced elbows with internal elbow pad compartments and adjustable cuffs. 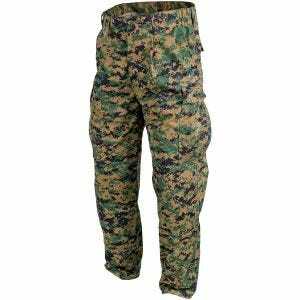 Matching combat pants go with a buttoned fly and elastic waist, six pockets, and reinforced seat and knees with knee pad compartments. Durable and fast-drying, perfect for everyday wear, Helikon MCCUU uniform is now available at Military 1st online store in characteristic Digital Woodland camouflage which is excellent for wooded, jungle, arid and tropical environments.